It’s Spring! 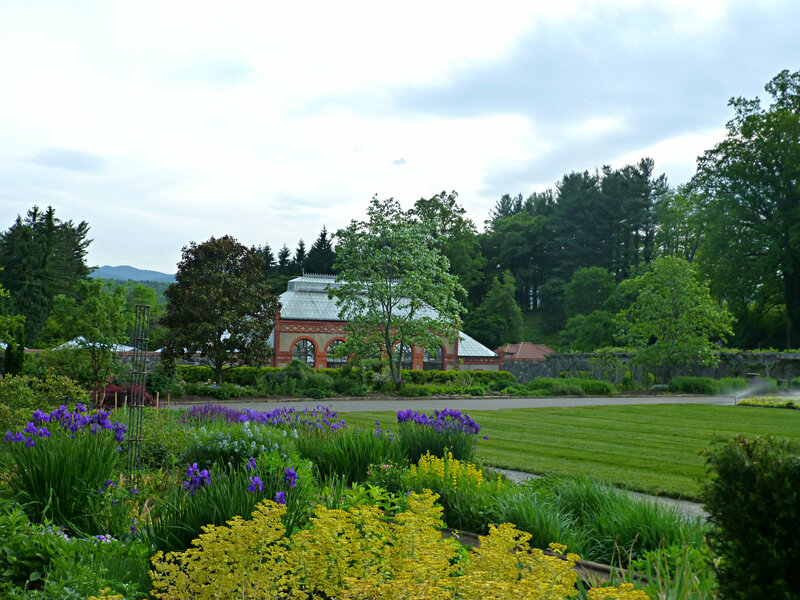 Our favorite season has arrived and one of our favorite places, Biltmore Estate in Asheville, is blooming big. Biltmore has several gardens on an 8,000-acre property, so you might be wondering…when is the best time to see Biltmore’s blooms in all their glory, and where on the estate should I go? Let’s discuss. First, when do the flowers bloom? Daffodils and pansies, fragrant hyacinths, beautiful forsythia and early flowering trees begin the springtime show at Biltmore in late March, followed by thousands of tulips and other flowers in early April. And when we say “thousands” of tulips, we literally mean thousands. Somewhere in the neighborhood of 74,000 in fact. The tulips are then followed in late April/early May by azaleas in every color, and then the roses and other flowering perennials join in through the month of May to lead us into summer. Walled Garden: This formal garden near the house (just past the Italian Garden with its three pools and beyond the Shrub Garden) is where you’ll find four acres of blooms and manicured lawns, as well as plenty of benches for sitting and watching Mother Nature wake up after winter. Dance among the daffodils and stroll by all the tulips. Then head through the Walled Garden and past the Rose Garden to the Conservatory, where you can view all the fabulous orchids, palms, ferns and tropical blooms inside. 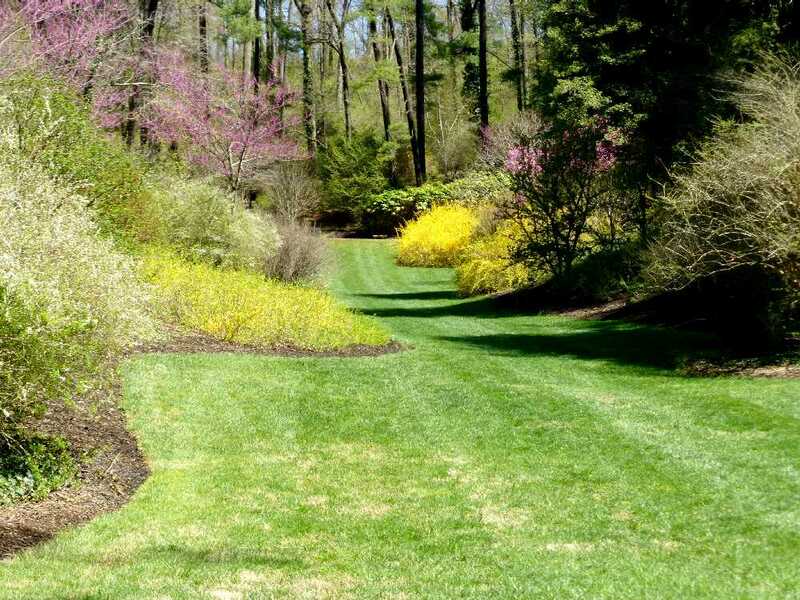 Spring Garden: The Spring Garden has a nice grassy lawn surrounded by flowering shrubs and trees, including forsythia and redbuds. We call this one of Biltmore’s hidden gems because it never seems crowded like the other gardens can sometimes be. To get to the Spring Garden from Biltmore House, a nice way to go is to take the stairs down at the far end of the South Terrace, then go all the way through the Shrub Garden, keeping to the far right. You can also get there via the far end of the Rose Garden near the little garden cottage. Azalea Garden: If you are lucky to visit Biltmore in mid- to late April or early May, get yourself to the Azalea Garden and prepared to be in awe. 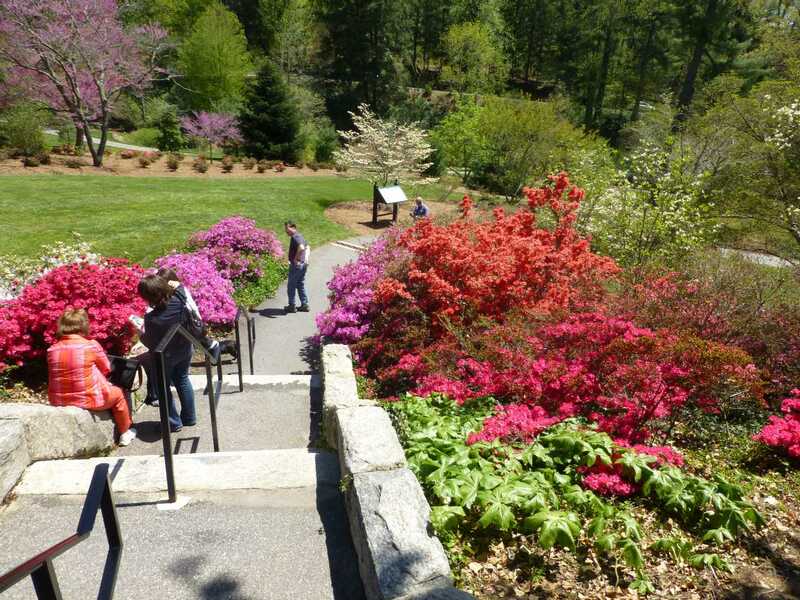 Those of you who like to garden will appreciate the fact that growing azaleas was a 60-year labor of love for the late Chauncey Beadle, a well-known horticulturalist who served as Biltmore’s superintendent. 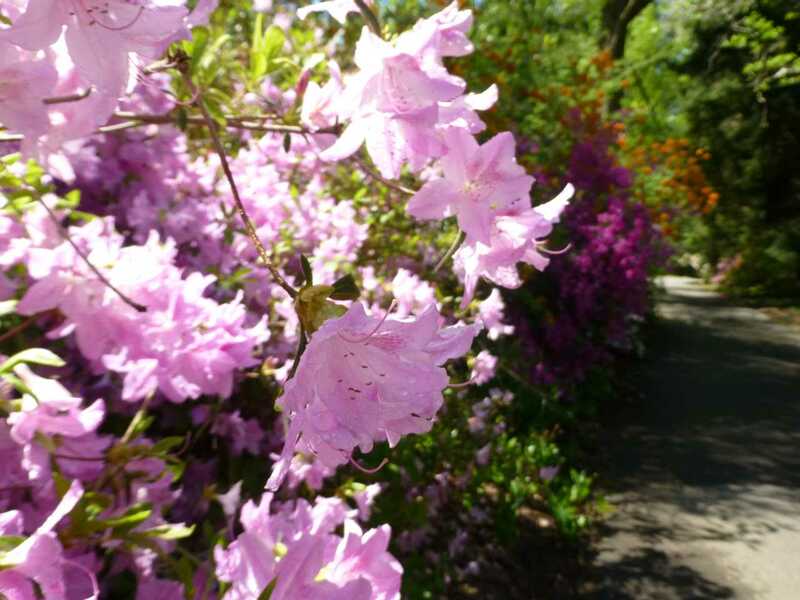 Set on 15 acres, the Azalea Garden contains large groupings of azaleas in every color and beautiful grassy lawns that are perfect for picnicking. Photos NEVER do this garden justice. It is truly amazing when in full bloom. Bonus tip: When you walk through the Azalea Garden, keep going and meander along some tucked away nature trails down to the Bass Pond. 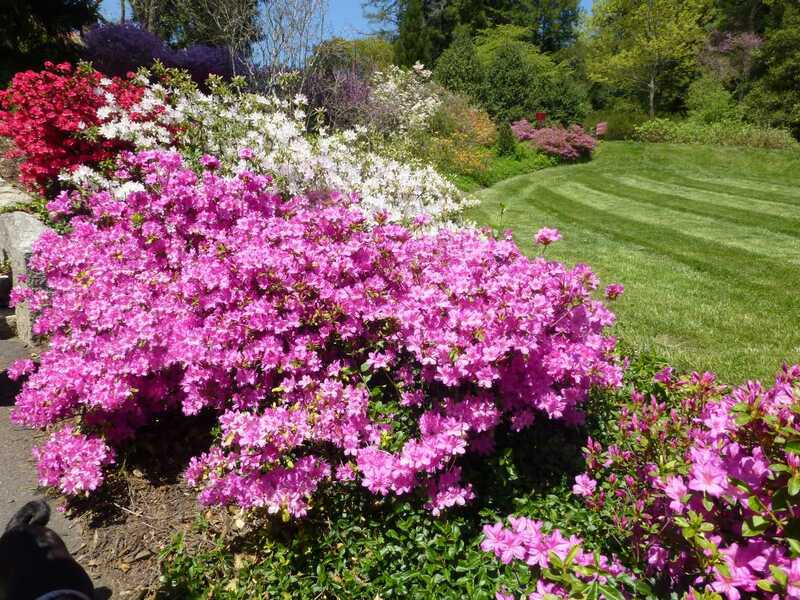 Shrub Garden: A lot of people might see the Shrub Garden simply as a set of connector paths between places, such as the house and the Walled Garden, or the Italian Garden and the Azalea Garden. But it is its own beautiful space, with plenty of flowering shrubs among the 500 specimens planted there. We especially love checking out the Japanese maples in the springtime. 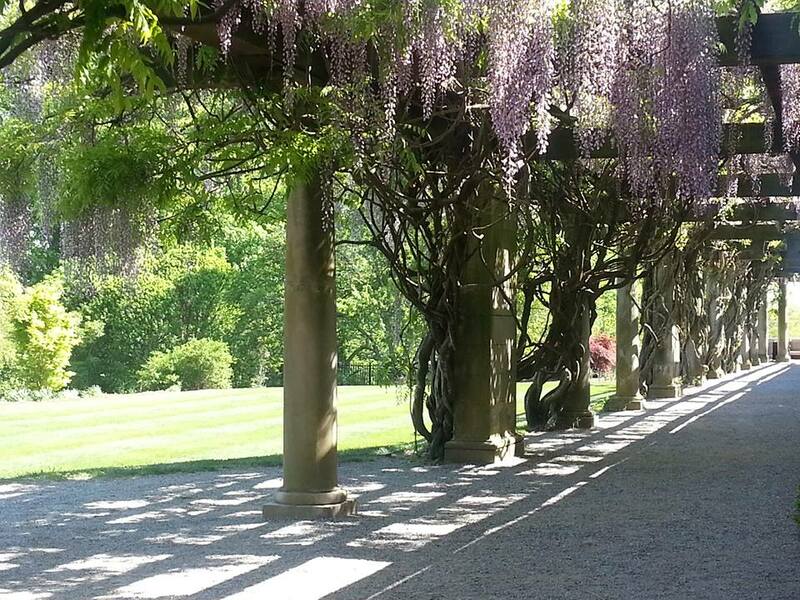 Plus, there is a spectacular set of blooming wisteria next to the house (below the South Terrace) on the way to the Shrub Garden (always blooming when we’re there in early May). Rose Garden: Biltmore knows roses. It has a fantastic rose garden between the Walled Garden and the Conservatory, with pathways that criss-cross the garden and allow you many opportunities to literally stop and smell the roses. They really get going in May. If you like roses, you will definitely be impressed when visiting this garden space. 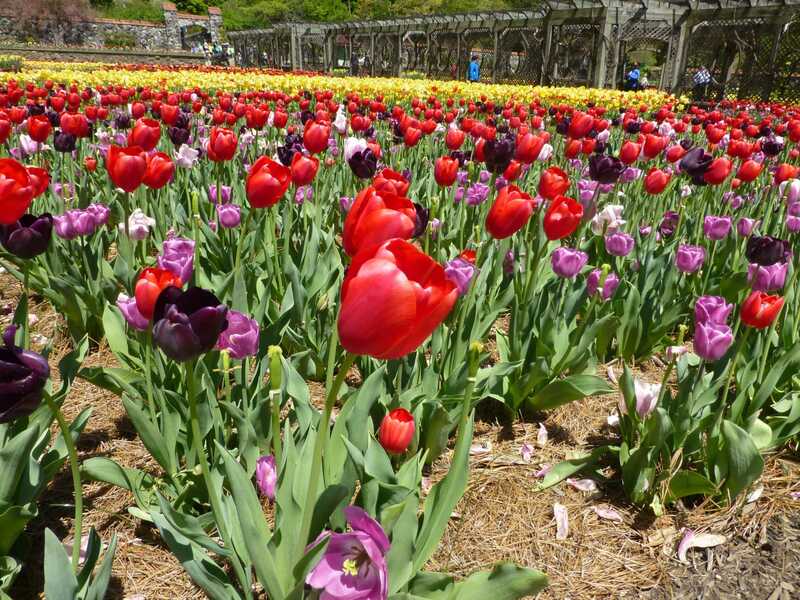 Walled Garden: The spring flower show in this garden doesn’t stop with tulips in April. Oh no, there are thousands of other beautiful annuals planted when the tulips are done, and they also have a White Border of white flowering plants and shrubs along one wall. You’ll see plenty of flowering perennials blooming en masse throughout the Walled Garden in May and on into summertime. Don’t forget! Our guests can get discounted tickets when staying at the Inn on Mill Creek, and those tickets are good for ANY DAY as well as the following day for FREE. With all these flowers to see and the house as well, if you have time, we recommend touring Biltmore House one day and then checking out the gardens the next day, or vice versa. That way, you’ll have time to stop and smell the roses. Or the hyacinths. Or whatever fragrant flowers are in bloom when you visit. This entry was posted in B&B Specials, Biltmore and tagged Biltmore, garden spaces, Spring by Inn on Mill Creek. Bookmark the permalink.